Here are our sponsors. Thank you! 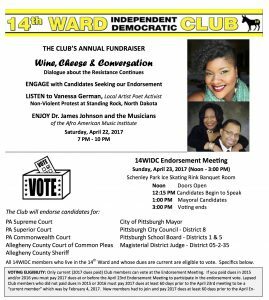 Every year the Club holds a fundraiser with entertainment, and for 2017, in keeping with our interest in increasing engagement in the north Point Breeze and Homewood area, we engaged musicians from the community treasure and vital cultural center in the Afro American Music Institute and poet-artist Vanessa German, who had a lot to say from her experience at the Dakota Access Pipeline Protest camps over the winter.